Welcome to the all new Leap Day V.I.P! • VIP room access to new exclusive power ups EVERY DAY! We appreciate all of your support. Thanks for playing. All new Speedrun mode: beat your best time and compare it with your friends. New level progression bar: you can now check your progress through the level in realtime. Localization added with new languages: Chinese, Russian, Spanish, German, French and Portuguese. New Settings menu, and now you can try Leap Day without Adverts, using the free trial of our new premium subscription! Issue with Google Play Services (sign in and achievements) solved. Prepare yourself for the Nitrome invasion as 10 of our most iconic characters have decided to add themselves to Leap Days new prize system! 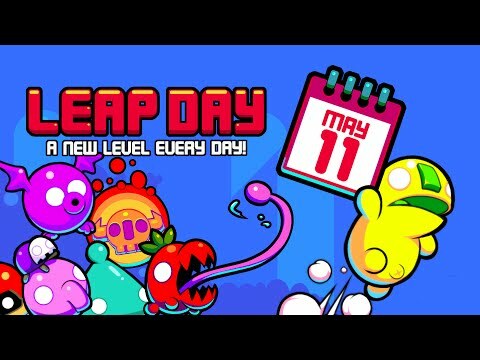 -Unlock 10 new playable characters in Leap Day each from a different Nitrome game! -30 new selfie poses to unlock and show of your spoils to your friends! -The prize system has been overhauled to be truly random... you never know what you’re going to get next! Prepare yourself for the Nitrome invasion as 10 of our most iconic characters have decided to add themselves to Leap Days new prize system!-Unlock 10 new playable characters in Leap Day each from a different Nitrome game!-30 new selfie poses to unlock and show of your spoils to your friends!-The prize system has been overhauled to be truly random... you never know what you’re going to get next!-We have added low cost unlocks to each character too! Leap Day is one year old today. Hip Hip Hurray!To celebrate we have lined up a whole week's worth of exciting new content, starting on May11th - May 17th. Join the party and see:- Hot air balloon rides- Candle soldier guards.- Greedy fruit bats- Strange alien bouncers.- Hellish homing missiles.- Gruesome grubs.- Deadly mushroom men.- Chomping jungle plants Make sure to check out our twitter page for the latest news on Leap Day and other Nitrome games.Thanks for playing! Minor bug fixes and algorithm tweaks.Thanks for playing Leap Day. - Major level bug fix: Fruit can now be collected 100% on certain days.- New cups animation: A cool new effect to make the trophies more noticeable and rewarding.- New splash screen: A brand new retro cartridge start screen, neat!Thanks for playing Leap Day. We can't wait to show you what's next. Changes and tweaks to level generation algorithm. This makes for a better gameplay experience.Thank you for playing Leap Day and look out for more updates coming to the game soon! Special update for you all to love this Valentine's Day! Two new Valentine's inspired Monsters to fight your way though plus a new and vastly improved level generating algorithm! Enjoy!Thank you for playing Leap Day and look out for more updates coming to the game soon! • Even 'MORE' exciting new characters to collect. 12 in all featuring (Chuckles the clown, Tickle the Apache, Felon the convict and many more)• Tons of brand new hilarious selfies to share with you're friends.• We've tweaked some snow and winter levels to make them more enjoyable to play and fruit collection less frustrating.For more news and updates follow Leapday's progress on twitter. Thanks for playing ! We implemented few fixes to displaying ads to improve performance.Thanks for playing Leap Day! Winter has finally arrived in Leap Day for a whole week of holiday fun.• Tons of brand new winter themed traps and enemies. (A new one introduced 7 days in a row! )• Two new exciting locations 'Ice Temple' and 'Snow Land'• A batch of new characters to unlock (Cotton head Mcloud anyone? )• A Brand new winter theme chiptune to get you in the holiday cheer.• Make sure not to miss New Years Day 2017 for an in game celebration!Happy Holidays. Thanks for playing Leap Day! To celebrate Halloween we have a special little treat in store for you all.-A brand new science lab background. including a giant 'FrankenYolk! '-A brand new enemy 'The Bone Fish ghost'.-New Rules: Enemies and traps are now assigned to specific backgrounds making the environments feel more defined. For example you may find cactus can only appear in the Desert, Beach, tropical and Magma stages.Feel free to follow it's progress over on twitter. Thanks for playing Leap Day. Bubble trap bug fix - player jump count is now reset after hitting a bubble.Thank you for playing Leap Day! Brand New characters-We've added 8 new characters for you to unlock. Play as a Rockman, Giant toad, Turret knight and more!-Tons of new selfies for each character. Experiment posing in game for some hilarious outcomes.Fixed bugs-We've fixed Mr Cactus being to tall and getting stuck in some levels.-Springs are now adjusted to stop players falling inside.-Barrels are now fixed to stop them falling trough the floorFollow us on Twitter to get the latest news on Leap Day. Thanks for Playing! *Cloud support*- Keeps your Leap Day data synced to play across ALL of your devices, neat!- Never lose your characters and level progress ever again.- Barrel Bug Fixes- Minor Bug Fixes and Optimisations- Level FixesThanks for playing Leap Day! *Tons of brand new levels*-We've been hard at work making LOTS of exciting new challenges. *Bug fixes and additions*-We've fixed the bug with the purple timed tiles that sometimes appeared to be invisible!-Levels have easy trap challenges earlier on. This makes levels even more fresh and exciting.Make sure to follow Leap Days progress on our twitter page! (more cool stuff is in the works). And let us know about any additions you'd like to see or bugs you find.Thanks for playing Leap Day! Leap Days first major update! *10 Brand new traps* (double the amount)- A Wall of Death Lasers!- Death Guillotines!- Sticky Slime coated Death platforms!- Swinging Death Logs!- The Human Cannon, of Death!- And up to 5 more... (there are 5 more)We have also included more awesome characters to unlock and tons of new levels to play through.Yippee! It's like Christmas, but in September.Be sure to follow us on Twitter for the latest news.Thanks for playing Leap Day! Leap Day is now even more exciting!-Brand new end of level Challenges - You'll never see the same two repeated!-Check out the all new Beach background with its own music too!-Minor bug fixes.We are constantly working on new and exciting updates for Leap Day. Make sure to follow us on twitter for the latest news and updates.Thanks for playing. Leap Day has just become even BIGGER in our brand new update!- 2 exciting new worlds are available for you to explore.- Each of the new locations has there own head bobbing new tunes too!- 'Hundreds' of new levels for you to beat bringing a whole new challenge.- Lots of little bug fixes to make your gaming experience even better.We have a ton of exciting new updates coming soon so keep an eye on our twitter feed for the latest news.Thanks for playing Leap Day.